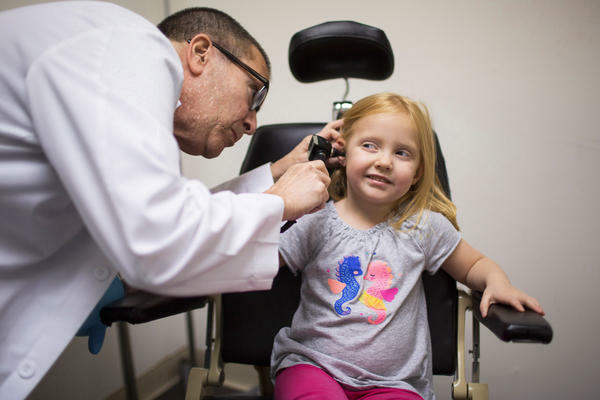 Dr. Max Lebow examines the ear of 4-year-old Charlotte Anderson at Reliant Immediate Care in Los Angeles. Charlotte's mom brought her to the urgent care clinic because Charlotte was having balance problems. Lebow (far right) is medical director of this urgent care center run by Reliant Immediate Care Medical. 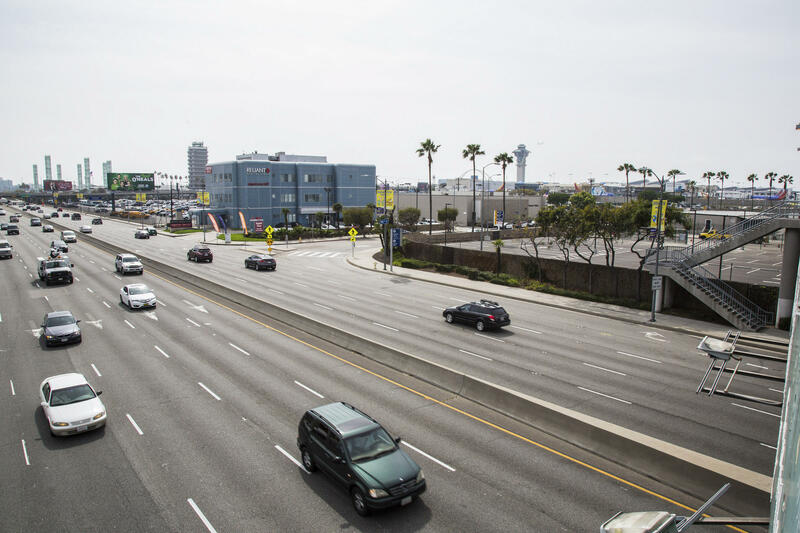 The clinic is adjacent to Los Angeles International Airport and is open 24/7. 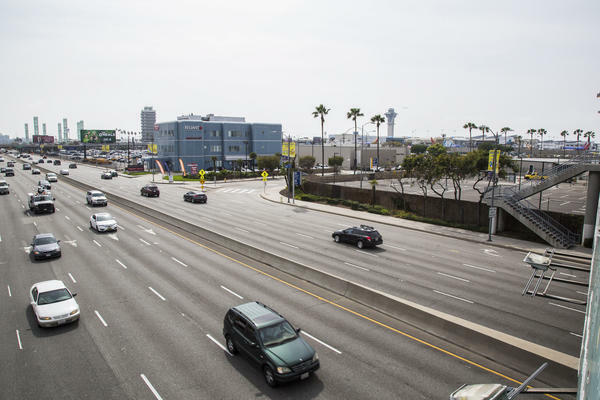 The location of Reliant's urgent care center near the airport exit makes it convenient for travelers and Los Angeles residents alike. Though the majority of Americans have a primary care doctor, a large number also seek treatment at urgent care centers, statistics show. 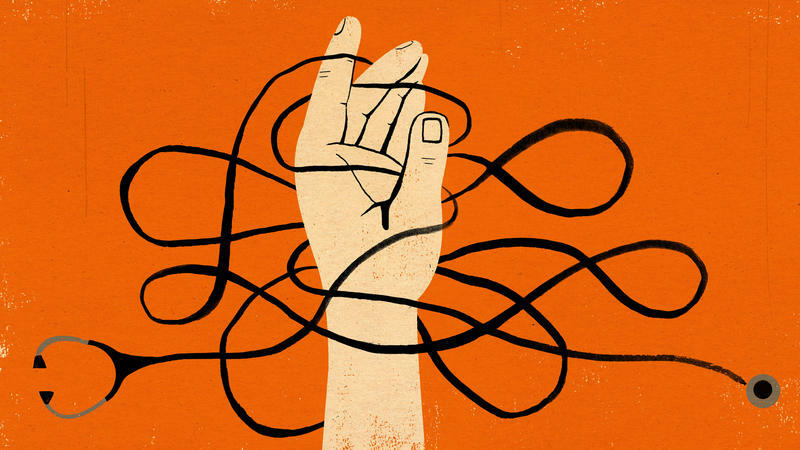 For many people, the centers have become a bridge between the primary care doctor's office and the hospital emergency room. Urgent care is not meant for life-threatening emergencies, such as a heart attack, stroke or major trauma, doctors say. But it is designed to treat problems considered serious enough to be seen that day — conditions like a cut finger, a sprained ankle, severe sore throat, or the sort of infection 25-year-old Dominique Page recently experienced. Page, who lives in Los Angeles, suspected she had a bladder infection when she woke up that morning. Instead of calling her primary care doctor, she headed straight to the nearest urgent care clinic. "I knew if I made an appointment at my doctor's office, it wouldn't be for today," she explains. "Their appointments are usually booked." Page's decision seems pretty typical. In a recent poll conducted by NPR, the Robert Wood Johnson Foundation and the Harvard T.H. Chan School of Public Health, most people reported going to urgent care because they believe it is more convenient and takes less time than going to their regular doctor. One in 5 said that at least once in the past two years, they were unable to see their regular doctor when they needed medical care, mostly because the doctor didn't have any available appointments, the office was closed or the doctor was out of the office. Page went to Reliant Immediate Care, adjacent to Los Angeles International Airport. Walk-in patients are welcome, and the clinic is open 24/7. "We don't even know where the key to the front door is," says the clinic's medical director, Dr. Max Lebow, "because at least in the 10 years that I've been here, we've never closed the front door." For years, Lebow says, he worked in a hospital emergency room, where he saw lots of people who "never should have been in the ER in the first place." In his experience, he says, maybe 20 percent of the ER patients are admitted to the hospital, which means that about 80 percent are sent home. National statistics suggest an even higher percentage tend to leave the ER without needing a hospital stay. Of those patients, Lebow says, probably 75 percent could be seen in a less intensive setting — like an urgent care center. After tests, Lebow confirmed that Page had a bladder infection and prescribed antibiotics. Page was relieved to have a diagnosis and treatment. She was in and out in less than an hour, she says, and — even better — her visit cost far less than going to a hospital ER, which charges a "facility fee" just to walk in the door. That fee — which typically ranges from $300 to $500 — helps cover the cost of having on hand, 24/7, all the equipment and staff needed to treat even the most extreme emergencies, explains Dr. Roger Hicks, an emergency medicine doctor on the governing board of the Urgent Care Association of America. According to a recent review from the National Center for Health Statistics, visits to the ER can easily run more than $1,000 for adults. The average visit to an urgent care center, in contrast, hovers around $150. Nationwide there are now more than 7,000 urgent care centers across the country, and Hicks calls the industry's growth in the past couple of decades "explosive." He says patients tell him they appreciate the cost savings and convenience — most urgent care centers are open in the evenings and on weekends and holidays. In large, urban areas, many are open around the clock. Most centers take private insurance and Medicare, although some don't take Medicaid; Hicks says Medicaid reimbursement doesn't cover the cost of providing care. Uninsured patients have to pay cash. 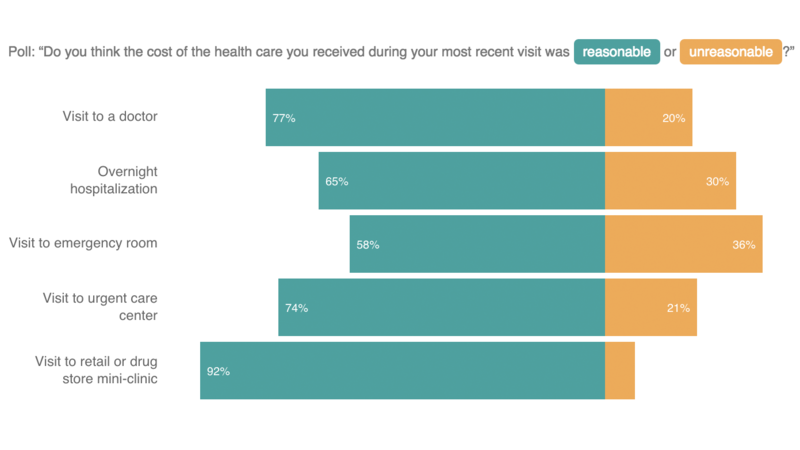 In our poll, most patients said they found the cost of their visits "reasonable." And the majority — 75 percent — rated the care they received as "excellent" or "good." But 25 percent of those polled described their care at an urgent care center as just "fair" or even "poor." One of those poll respondents was 31-year-old Syntyche Toniy, who lives in Orlando, Fla. Toniy went to her local urgent care center after cutting her hand while gardening, and says she found the process there "disorganized." After registering at the front desk, she waited another two hours before seeing a doctor, who then sent her to the hospital emergency room anyway — for stitches. Another woman who responded to the NPR poll — 69–year-old Carole Lamb in Ashland, Ore. — recalls a frustrating experience during her visit to an urgent care center for symptoms of bronchitis. Lamb told the doctor that she'd previously been prescribed a medication for her infection, but it hadn't worked very well. As she was explaining the situation, the doctor got up, walked out of the room and sent in an assistant who gave her a prescription for the very same medicine. "I thought, really?" Lamb says. Fortunately, she adds, she was able to get an appointment within a few days with a new primary care provider — who successfully treated her infection. Hicks says his association continues to work hard to improve quality and maintain high standards in urgent care centers nationwide. While most centers are standalone facilities, some are embedded in large, integrated hospital systems. At the UCLA Urgent Care facility in Santa Monica, Dr. Vladimir Manuel, the medical director, says the beauty of a large integrated system is that primary care, urgent care and hospital care are all connected, so medical records are shared. Not only is that sort of system more efficient, he says, but patient care is improved, too. For example, Manuel says, if someone with asthma shows up at the urgent care center two or three times for difficulty breathing, Manuel will reach out to the primary care provider and let them know the patient's asthma is not under control. 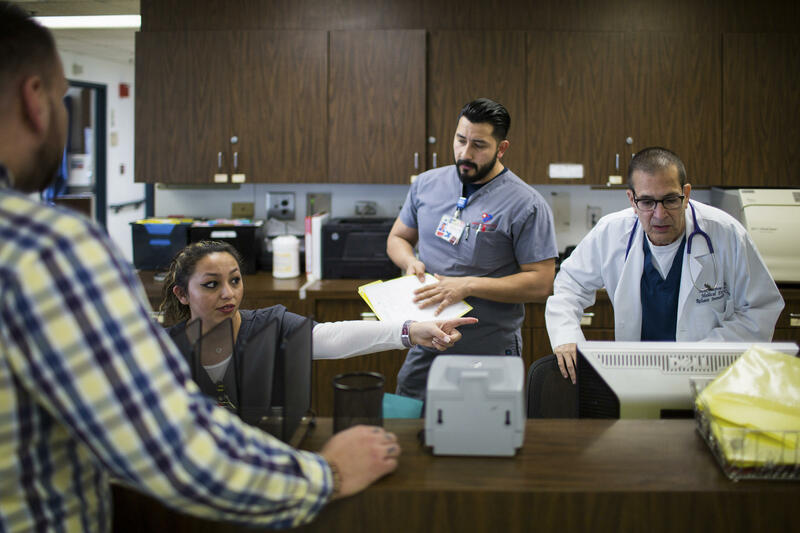 He sees his center's job, in part, as helping each patient establish a better continuity of care, so those sorts of medical emergencies arise less frequently. And if patients don't have a primary care provider, Manuel helps them find one within the system of UCLA Health. One thing is for sure, says Hicks: Until the shortage of primary care doctors eases nationally, the number of urgent care centers — and their use — will continue to climb. Today in Your Health, we're going to look at one of the fastest-growing sectors of the health care system - urgent care centers. A poll conducted by NPR News, the Robert Wood Johnson Foundation and the Harvard T.H. Chan School of Public Health found that people are using urgent care centers more often than in the past. One reason is that it's hard to get an appointment with a regular doctor. NPR's Patti Neighmond reports. PATTI NEIGHMOND, BYLINE: Think of urgent care as a bridge between your doctor's office and the hospital emergency room. It's not for life-threatening emergencies like heart attacks, stroke or major injuries. Urgent care is for problems that need to be seen that day but aren't life-threatening, things like a cut finger, sprained ankle, severe sore throat or infection. DOMINIQUE PAGE: I woke up this morning, you know, I just feel achy. NEIGHMOND: Dominique Page suspected a bladder infection. But instead of calling her doctor, she headed straight to a nearby urgent care clinic. PAGE: Because I know if I had made an appointment with my doctor's office, it wouldn't be for today because I'm sure their appointments is usually booked. NEIGHMOND: Most people in our poll say they go to urgent care because they say it's more convenient and takes less time than going to the doctor. But 1 in 5 say that at least once over the past two years, they were unable to see their regular doctor or a health professional when they needed medical care, mostly because their doctor didn't have any available appointments, the office wasn't open or their doctor was out of the office. Page went to Reliant Urgent Care at LAX Airport in Los Angeles. Walk-ins are welcome and the center's open 24-7. MAX LEBOW: We never close. We don't even know where the key to the front door is because at least in the 10 years that I've been here we've never closed the front door. NEIGHMOND: Dr. Max Lebow is the medical director here. He worked as an ER doctor for years and saw lots of people he says who never should have been in the ER in the first place. LEBOW: Twenty percent of all emergency department patients are admitted to the hospital, meaning 80 percent go home the same day. Of that 80 percent, probably three-quarters of those could be seen in a setting other than the emergency department. NEIGHMOND: After tests, Lebow confirms that Page has a bladder infection. He prescribes antibiotics and suggests she also do the old-fashioned thing. LEBOW: Drink plenty of fluids. You know, you have to drink, drink, drink. And you should drink enough, you know, water, juice, Gatorade so that you're urinating every four hours or so. NEIGHMOND: To help flush the infection out of her system. Page is relieved to get diagnosed and treated. She's in and out in under an hour. Even better, care like this costs far less than a hospital ER. Dr. Roger Hicks with the Urgent Care Association of America. ROGER HICKS: Emergency departments charge what's called a facility fee, which is anywhere from 300 to 400, $500 because they have to be open seven days a week, 24 hours a day. And they have to be staffed and equipped to handle any kind of emergency, the most extreme emergencies. NEIGHMOND: And that facility fee is just to walk in the door. It doesn't include the cost of seeing a doctor, X-rays, lab tests, medications or IVs. HICKS: An average emergency department visit is over $1,400. And, you know, the average urgent care visit is about a tenth of that. NEIGHMOND: Most urgent care centers take private insurance and Medicare. Some don't take Medicaid because they say it just doesn't cover the cost of providing care. Uninsured patients have to pay cash. In our poll, most patients said the cost was reasonable. And the majority - 75 percent - also said the care was excellent or good but not everyone. Twenty-five percent of people polled described care as just fair or even poor. One of those is 69-year-old Carole Lamb, who lives in Ashland, Ore. She recently went to an urgent care center for bronchitis, where she told the doctor about a medication that hadn't worked in the past. CAROLE LAMB: And he sat there and he prescribed the very same thing that hadn't worked. And as I was explaining to him again, you know, that's the one that didn't work. And do you have anything else? He just walked out of the room and left and sent somebody with a prescription for the same thing and that was it. And I'm like really? What? NEIGHMOND: We called some other people, too, after they answered our poll. And they described long waits and ending up in the emergency room anyway. Some told us they believe their care was inadequate. The Urgent Care Association's Dr. Hicks says the Association continues to work hard to improve quality and maintain high standards of care in centers nationwide. And there's another kind of urgent care that's growing, too. Most urgent care centers are standalone facilities. But some, like this one, are embedded in large, comprehensive health care systems. VLADIMIR MANUEL: Have your chest all the way against the board. You're going to roll your shoulders forward. NORMAN WEINER: That's hard for me to do. MANUEL: Oh, OK, that's fine. You can give it a big hug. So you can put your arms around it. NEIGHMOND: Eighty-five-year-old Norman Weiner gets a chest X-ray at UCLA's Wilshire Urgent Care. He came in with a cough and shortness of breath. Medical director Dr. Vladimir Manuel prescribes medication and tells Weiner he'll help him find a primary care doctor at UCLA Health. And that's the beauty of a large integrated system, he says - care in the doctor's office, urgent care and hospital care are all connected and medical records shared. Not only is the system more efficient, says Manuel, patient care is improved. MANUEL: If we see them two or three times for their asthma, we'll sort of reach out to their main doctor and say hey, you know, we're seeing your patient for their asthma. Perhaps there's ways of getting them better controlled so that they aren't coming into urgent care as much. And we'll get them placed back with their doctor and engage that kind of more continuity, preventive aspect of care and not just the sort of in-the-moment dealing with the problem and then out the door, you're done. NEIGHMOND: Whether embedded in large systems or standing alone, the Urgent Care Association's Dr. Roger Hicks says the dramatic growth of urgent care centers can be expected to continue in coming years, particularly since there's a continued shortage of primary care doctors. Patti Neighmond, NPR News. Transcript provided by NPR, Copyright NPR. A series of polls in key states by NPR and its partners finds that more than half of adults in the U.S. believe the Affordable Care Act has either helped the people of their state or has had no effect. Those sentiments are common despite all the political wrangling that continues over the law. About a third (35 percent) of adults say the law has directly helped the people of their state, while a quarter (27 percent) say it has directly hurt people.